The thrilling finale to the New York Times bestselling Young Elites series from “hit factory” Marie LuThere was once a time when darkness shrouded the world, and the darkness had a queen.Adelina Amouteru is done suffering. She’s turned her back on those who have betrayed her and achieved the ultimate revenge: victory. Her reign as the White Wolf has been a triumphant one, but with each conquest her cruelty only grows. The darkness within her has begun to spiral out of control, threatening to destroy all she's gained. When a new danger appears, Adelina’s forced to revisit old wounds, putting not only herself at risk, but every Elite. 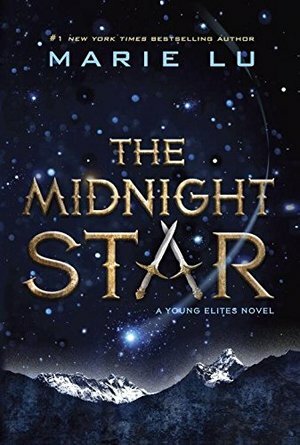 In order to preserve her empire, Adelina and her Roses must join the Daggers on a perilous quest—though this uneasy alliance may prove to be the real danger.#1 New York Times bestselling author Marie Lu concludes Adelina's story with this haunting and hypnotizing final installment to the Young Elites series. Dull ending to what could have been a great trilogy. Maaaaan. I had hoped that perhaps the last act of Lu's 'Young Elites' trilogy would redeem itself but, uh, no. Honestly? A lot of nothing really happens in this book. I mean, Adelina is the Queen and now she's extracting her revenge. I guess when you live long enough to become the villain it's not so easy sometimes. So she's ruling and of course old characters come back to haunt her for one last final act. There are some battles. Some deaths. Some things are the same, much of it is not. And so ends an epic story. Except, it's not. I'm not sure what it was but books 2 and 3 in this trilogy really didn't pan out for me. I felt the storyline lost its way maybe halfway through Book 2 (maybe before) and shouldn't have introduced the character Maeve at all. It just seems like her, the characters associated with her and the storyline just seemed not really needed. I appreciated that romance remained more on the back burner (mostly) but even then it was dull. I'm not a shipper at all and typically don't care but the ones in this book were mostly eh. I have to say, I'm somewhat not surprised the book ended this way. The characters were drawn to be grey (sometimes much darker). A certain death in the beginning telegraphs too easily that a death to a particular character will happen later in the book. In some ways I somewhat felt this was like the last book in the Harry Potter series: Rowling waited until the end to slaughter a bunch of characters and I felt this book fell into a similar trap. That's too bad. I still really liked 'The Young Elites' a lot but perhaps this was a story really only meant for one huge tome rather divided up into 3 shorter books. Maybe someone else will like it and this is me with my lukewarm feelings towards YA. Still, I thought overall this was still more interesting than Lu's previous work so I'll keep an eye on her stuff for the future.